This homemade Mayonnaise is extra delicious because it is made with Greek extra virgin olive oil, which is the best. It’s mild and fruity taste is the star of this condiment. Anything with olive oil is a “must” in Greece because it is much healthier. However, due to its calories, as any other mayonnaise, always use it in moderation, as the ancient Greeks used to say “pan metron ariston”. Yesterday was a public holiday and all the shops were closed and I needed some mayonnaise, so it was a good opportunity for me to make some. I was planning to make some for a while now and had already bought some mustard seeds. It’s really easy to make mayonnaise and all you need are eggs, some lemon juice, salt, mustard seeds, white pepper, and olive oil. I prefer olive oil as it gives it extra flavour and colour. Put the yolks, lemon juice, mustard seeds, salt, and pepper into the blender and mix them on low speed. After a few minutes of mixing add the olive oil, a teaspoon each time until all the olive oil is added. Refrigerate until it is used. This and many other recipes are included in my cookbook Mint, Cinnamon & Blossom Water, Flavours of Cyprus, Kopiaste! 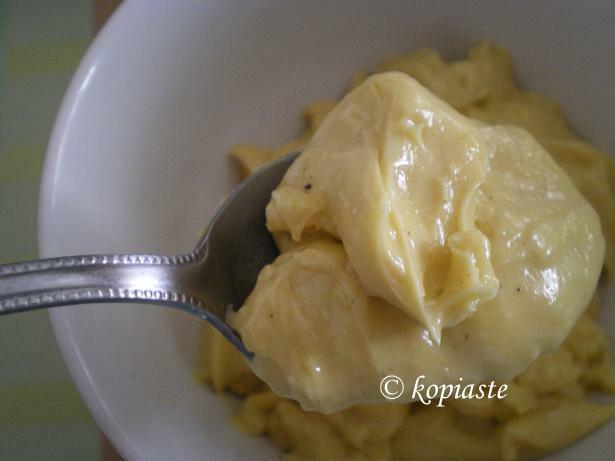 This is a lovely and handy recipe.. nothing better than having homemade mayonnaise. Thanks for sharing with us. Ηi Val, Swati and Nuria. I had a few failures before making it right but it is worth the effort. Thanks Nuria for letting me know about the pictures. I hope I have fixed it now.